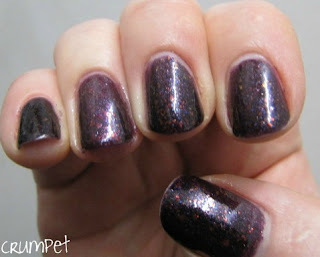 Today has been a better day thankfully, and I am wearing a fabulous polish – what could be better ? 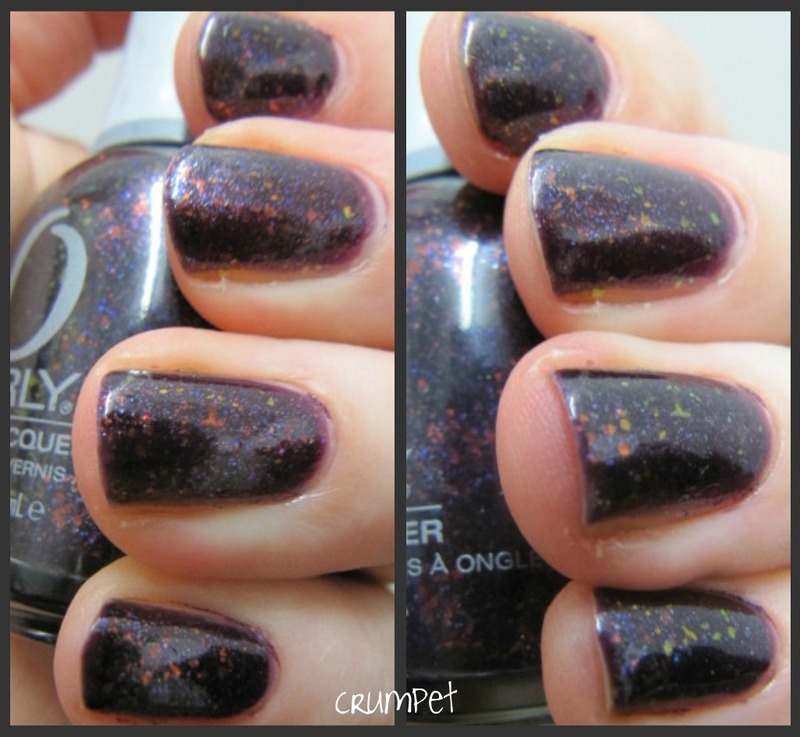 Finally, I am wearing Orly Fowl Play, only about a gazillion years after the rest of the world! 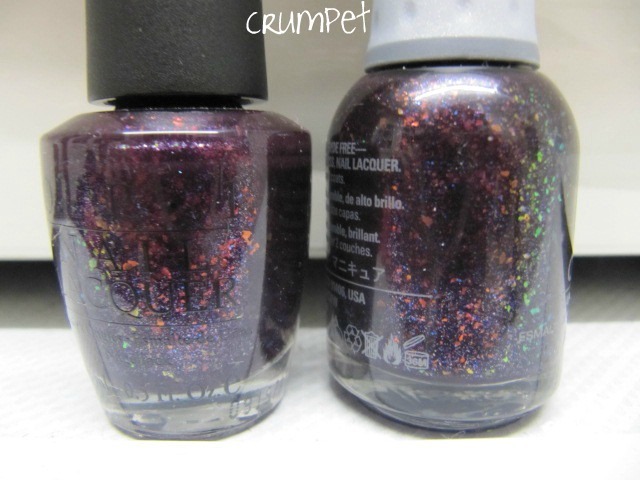 So Crumpet, why have you waited sooooo long to get this polish when usually you can’t get your grubby little paws on new purples fast enough ? Wellllll, me and Orly don’t have a loving relationship. 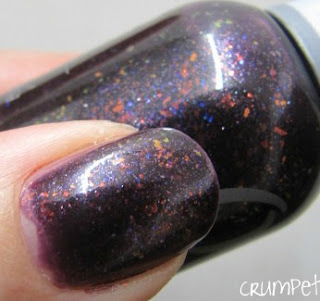 Whilst I love the bottle, the fact you get 18ml (wow) and their fabulously ergonomic wand, I find the polish a little meh. All the ones I have tried have been really thin and watery and therefore left me disappointed. Believe me, having the faith to try Fowl Play took a lot of compromising on my part. Wow, I compromised for my art! Lol. 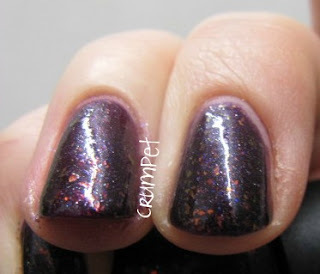 Also, I saw so many posts about was this a dupe for OPI’s Merry Midnight, and being the snob I am, wanted MM. So I got it, loved it, and then still got this one! Honestly, sometimes even *I* don’t understand myself! So here she is, and despite the fact I had to use 3 coats, she’s lovely. 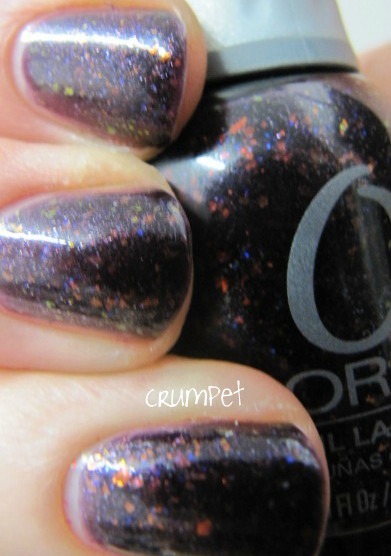 I LOVE the Orly wand, it’s soooo comfortable to hold, and really helps you apply the polish. The base colour is a lovely rich purple with some warm tones, but not quite as burgundy as MM. The flakies are gorgeous, and seem to flash more colours than I remember MM showing – green, yellow, orange and BLUE, which is a fabulous contrast to the base. This reminds me a of an exotic speckled egg, maybe something the evil purple dragon would lay. It’s got that amazing smattering of colour that is indistinct yet mesmerising at the same time. I shouldn’t assume of course that all of you are familiar with Merry Midnight. 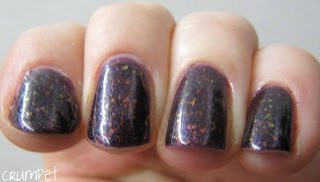 A lot of you might be reading this right now and thinking this is the most amazing polish you’ve ever seen, and you wouldn’t be far wrong. For those of us who feed our addiction with Google image searches, it’s easy to forget how we first reacted when someone picked an amazing purple and added some flakes to it. 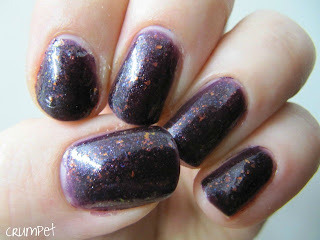 This IS a genius polish, no doubt at all, and EVERY girl should own something similar. 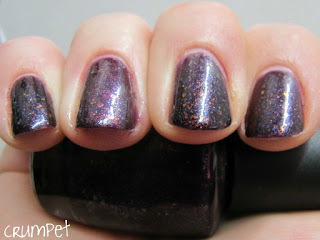 The perfect colour + flakies = pretty much 100% perfect combination. 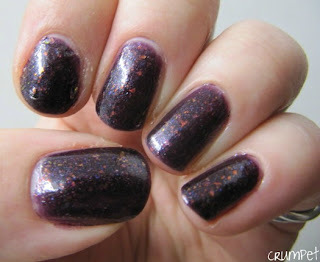 So yes, this is a wowzer of a polish, a bottle of awesome sauce dribbled over some amazeballs. This is an addict’s polish – ever so decadent, ever so pure, and ever so fan-flippin-tastic. So, DOES it compare to Merry Midnight? Well first off – do they look a little different in the bottle? No, not all really. Whilst you might think 1 has a bit more blue than the other, this is mainly just a question of how many flakies are being caught by the light – tilt the bottle and the picture changes. On the nails … well, can you guess which one is MM ? It’s the ring finger, it also had 3 coats, and I am quite surprised by how much difference there is. Definitely warmer, more burgundy, a lot less blue, and actually, a fair bit less flakiness. The speckled effect is definitely less. So, 2 gorgeous polishes. Practically identical. Fowl Play is pretty much like your mother improving on your grandmother’s recipe. OPI must be LIVID! 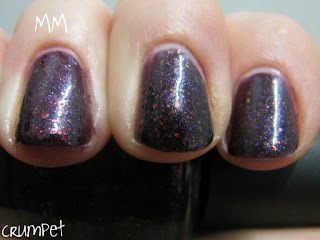 If you can’t get MM, Fowl Play will do fine – it’s just as nice, just as gorgeous, just as distinctively wow. But since when has that ever stopped us lemming more ladies ?